Use the NOAH online compendium to access veterinary medicines datasheet information. 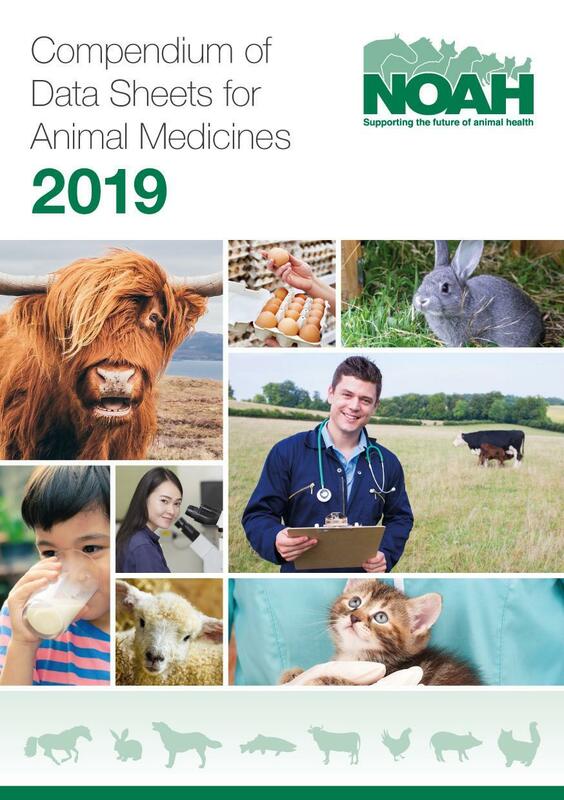 The 2019 edition of the Compendium is now available to order from the NOAH office..
NOAH (the National Office of Animal Health) represents the UK animal medicine industry: our aim is to promote the benefits of safe, effective, quality medicines for the health and welfare of all animals. The NOAH Data Sheet Compendium contains data sheets for the majority of veterinary medicines authorised for use in the UK but it is not a complete list of them all. A full list of UK authorised veterinary medicines can be found on the VMD section of the .GOV website. Occasionally the distributor of an authorised veterinary medicine may be different from the Marketing Authorisation Holder and this will be indicated where appropriate in the individual data sheet entries. If you have questions about the use of a product then the distributor would be the normal first point of contact. The data sheets in this Compendium are prepared independently by each participating company and each proof is checked and the text confirmed as correct by the participant concerned. The responsibility for accuracy lies with the participating company. NOAH gives no guarantee whatsoever as to the accuracy of the information contained in the data sheets and accepts no liability whatsoever in respect of any loss, damage or expense arising from any such information or for any error or omission in the data sheets and in particular (but without prejudice to the generality of the foregoing) shall not be liable for any consequential damages or expenses or any loss of profits or any liability to third parties incurred by anyone relying on the information contained in the data sheets appearing in this Compendium. The printed version of Compendium of Data Sheets will continue to be published annually by NOAH. To order copies of the book, please click here for an order form. The information on the web version may at any time supersede that published in the book, and should be taken as the more up-to- date version, as it will contain changes and additions as variations to marketing authorisations are approved. Join us at www.pethealthinfo.org.uk – NOAH’s pet owner website with unbranded information on pet healthcare. Help your clients to get more from responsible pet ownership! To ensure you have access to a high quality Compendium service, please continue to use our free of charge web-based Compendium, which is updated regularly and contains the most up-to-date information. If you have not been on the website lately you will see we have introduced a ‘Company Directory’ as well as ‘datasheets by company’, as well as improving the print facility.